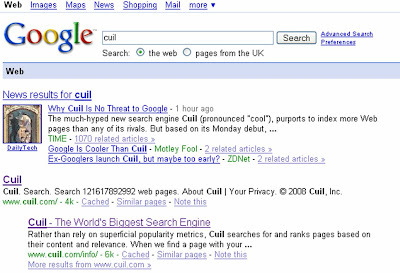 Cuil.com is not the number one result on Google for a query on the word 'Cuil.' Given the amount of press coverage that was generated by the launch of Cuil yesterday, and the importance Google gives to inbound links, then users would probably expect Cuil.com to be the number one natural search listing on Google today? However whilst Live.com, Yahoo, Summize etc are all the top natural search result against queries for their names, Cuil is presented after a series of news stories criticising the new engine. Coincidence or something else going on?